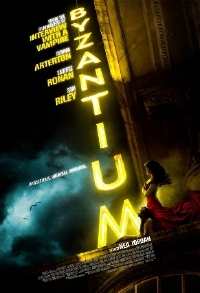 It's been some time since Byzantium's debut last year and the release of a clip for Neil Jordan's return to the realm of vampires. IFC will be releasing the movie later this year and they're tempting our appetites with the first trailer. Gemma Arterton and Saoirse Ronan star as Clara and Eleanor, a mother and daughter who also happen to be 200 year old vampires. The story spans two centuries and appears to cut back and forth between the two timelines, telling the tales of Clara's passionate love affair during the Napoleonic Wars and Eleanor's abandonment as a child alongside the events unfolding in the present which have the pair living at the Byzantium Hotel and trying to stay one step ahead of the people who are trying to hunt them down. The trailer is beautiful, full of lush period drama and stark modern landscapes. It will be interesting to see how the two styles come together but Jordan had great success with the similarly styled Interview with a Vampire so it bodes well that he'll be successful here. Or so I hope.